I caught my first glimpse of the mesmerizing blue shades of the Indian Ocean from the window seat of a turbulent flight. As we geared for landing, the clouds parted to reveal a turquoise water body surrounding a tiny island; I’m not quite sure if the island was indeed Mauritius or one of its many neighbors in the ocean, but that first glimpse was everything I had dreamt about on my first trip to this paradisiacal island (and indeed my first time in the continent of Africa). Over the last 5 days, I have fallen in love, over and over again, with the enchanting landscapes in the interior of the island; endless plantations of sugarcane swaying in the wind, rocky hills and mountains keeping me company on my two wheels, patches of green farm land being lovingly tilled by men & women in colorful clothes holding colorful umbrellas, and glimpses of the deep blue sea teasing me from beyond the mountains. 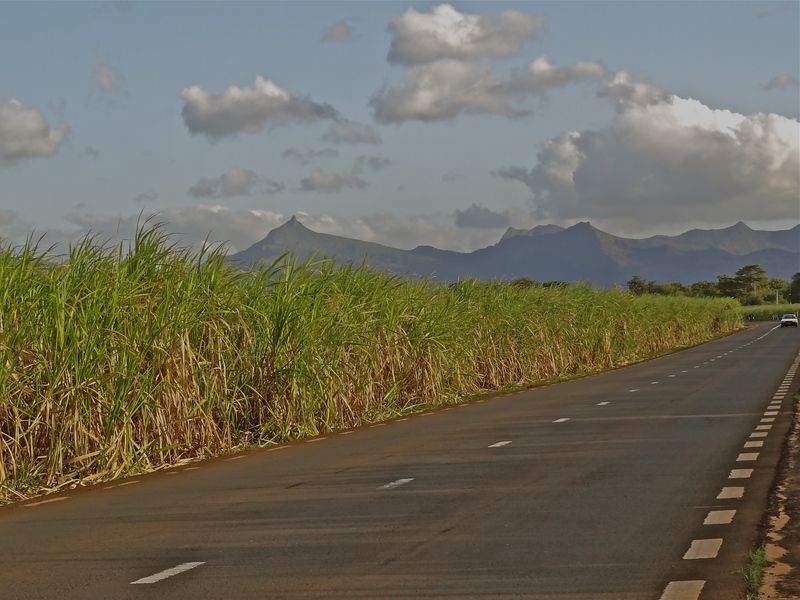 Driving along the sugarcane fields in Mauritius. I have spent my mornings being greeted by the Indian Ocean, which changes shades from deep blue in the early morning, to turquoise in the mid afternoon, to a light sky blue in the evening, and gets colored by the hues of the sunset at dusk. The coastal breeze keeps the waters choppy, and I have gotten used to waking up to the endearing sounds of its waves. 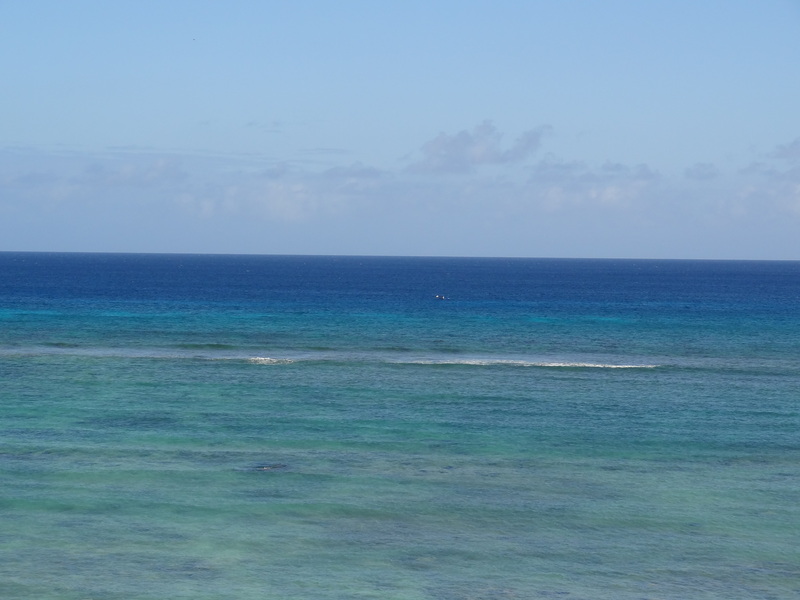 The colors of the ocean from my room at Le Meridien I’le Maurice. 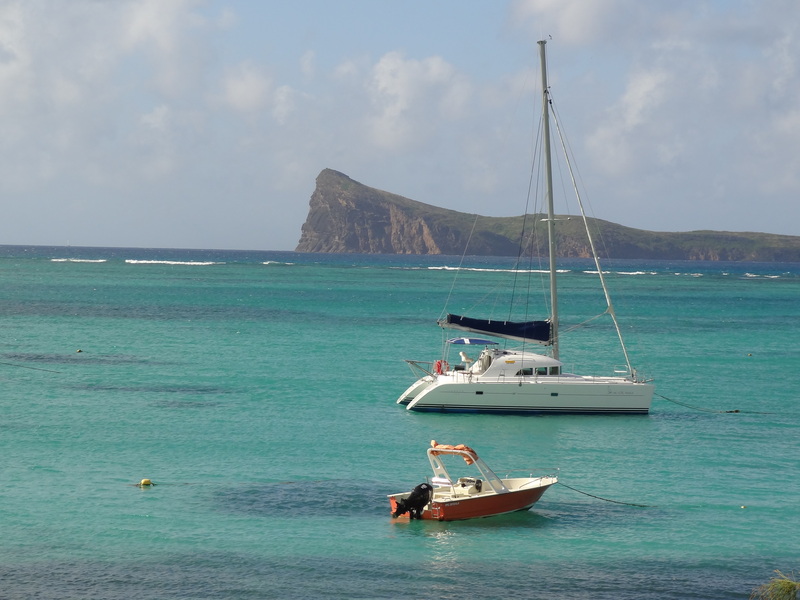 The northern tip of Mauritius, at Cap Malheureux, with Coin de Mire in the backdrop. Subconsciously, I did expect Mauritius to sweep me off my feet, what with so many magazine covers and travel publications carrying dreamy, postcard-like pictures of its coastline and beaches. But the island has really found its way to my heart through the things I didn’t know before I got here, the things that no one mentions about the island; the sugarcane fields, the Creole cuisine, the Mauritian rum, and most of all, the laid-back attitude and the exceptional friendliness of its people, who come from so many different backgrounds, communities and cultures, and yet have a way about them that is uniquely Mauritian. Over the next 10 days, I will continue to explore the island’s best-kept secrets, experiment with the local cuisine, try my hand (and feet) at maneuvering the blues of the Indian Ocean, shake a leg in the S’ega dance, and adopt the chilled out way of life that characterizes the people from the island. On an impulse, I have also booked myself on a flight to Mauritius’ lesser known (and sleepier) sibling, the island of Rodrigues, who’s shores I can’t wait to land upon. Join me on Twitter and Facebook to follow my live updates from the Indian Ocean! Peaceful and enchanting ! cant wait to read more ! I had stayed at the Le Meridean too when I went there about only a few months back. Loved the serenity of the island, the diverse landscapes and the beautiful ocean. Enjoy your stay and driving around! Thanks Richa 🙂 Loving my stay here as much, and even though it’s one of the bigger hotels on the island, love how hospitable and personable the staff is. I wish I could visit Mauritius some day!! Watch this space. I have something very special coming up soon that could make that dream come true! I would love to go to Mauritius. I look forward to your future posts. I’m sure you’ll love it Debra. Will be posting more soon! Beautiful! Wondering how beautiful it’d be to spend an evening by this seaside. With dreamy eyes I await to read your journey of Mauritius’ best kept secrets! I just came across your blog and I found that you even visited my country – Mauritius. Thank you for having been here and for writing so good about Mauritius. Previous Post10 Travel Tips For Your First Trip to Turkey. 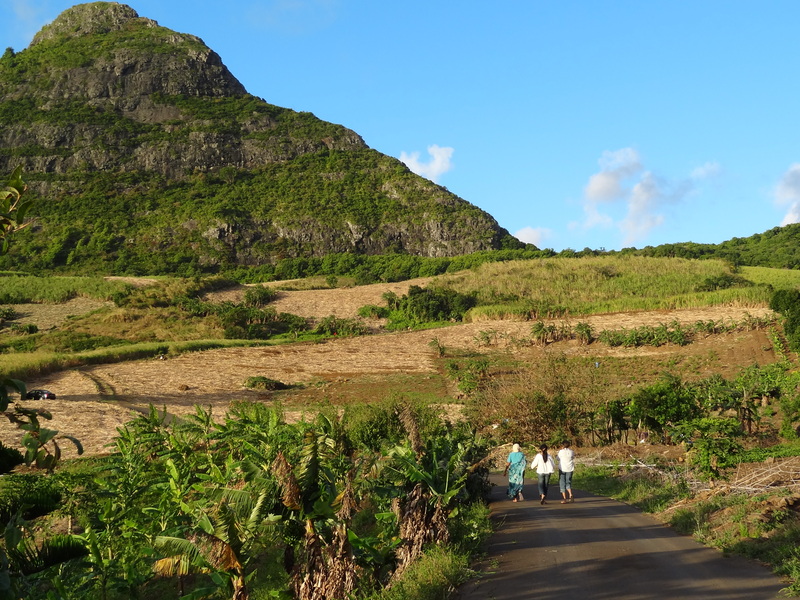 Next PostDiscovering the Wilderness of Mauritius.